"If you want reliable and honest service, look no further. 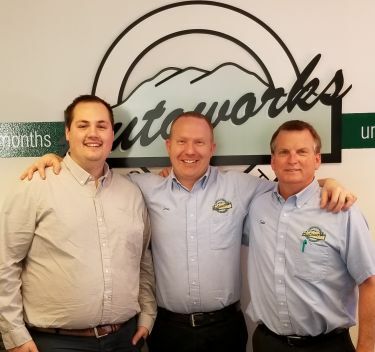 I have been seeing John and the rest of the Autoworks of Issaquah staff for the past 6 years and have no intention of going elsewhere!" "Extremely accommodating, technically astute, very efficient, very fast service, yet very complete without any errors. Does the job right the first time without having to bring the car back." 5 star review by Bill O. "I have been bringing my cars to your facility for over 15 years. I am extremenly happy with the quality of work performed. My car runs like new and it is 12 years old!" Your local family of experts at Autoworks of Issaquah have been taking care of automotive service and repair needs since 1982. The team at Autoworks of Issaquah understands the vital importance behind routine maintenance and quality repairs. We understand the inconvenience it can be to have your vehicle in for service. Since trips to service your car are unavoidable, we strive to make your visit with us as stress-free as possible. You will feel more like family than just another number. Any time your vehicle is with us, it's in good hands. We examine and treat every vehicle like we would our own. Our highly-trained ASE Certified technicians are here to provide any routine inspection or maintenance, as well as any repair your vehicle may need. We regularly serve Issaquah, Sammamish, Bellevue, Snoqualmie, Renton, and other local areas. Trust is the single most important quality in any relationship. Whenever you find a qualified mechanic that you can trust, you should put him or her on speed dial. Today is your lucky day, Autoworks of Issaquah is an entire team of service professionals that you can trust! The maintenance, diagnoses, and repairs that you receive from our facility will always prevent and solve problems. If you’re wondering what that strange vibration is, or what’s causing that knocking sound under the hood, we consider that a problem. You probably do too! Have us look at the problem first, so you’ll always be on the right path to repair. Our services will always save you time and money. At Autoworks of Issaquah, we stand behind all of our quality services and repairs with a competitive guarantee. You’ll drive away from our facility behind the wheel of a fully reliable vehicle. Top quality repairs using the best quality parts and timely maintenance services make sure you won’t be coming back anytime too soon. That’s the goal of any quality mechanic! You can schedule your appointment right now if you'd like. Just use our convenient online scheduling system and pick a day that works best for you, or call us at (425) 270-8911. If you're going to be in the area, please feel free to stop by!